Key Feature #6. 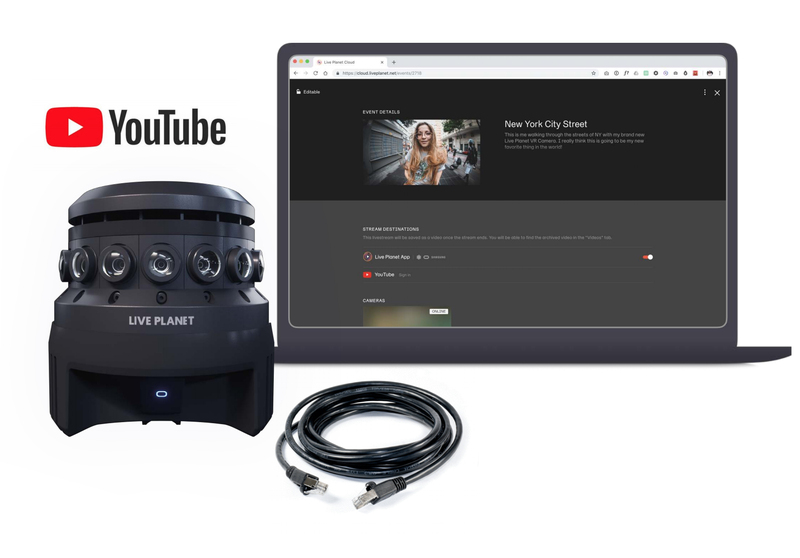 Use our Live Planet cloud to quickly set up a livestream from your camera to third party streaming platforms like YouTube. Beware, setting up 360° streaming onYouTube can be complex. This is unrelated to Live Planet. 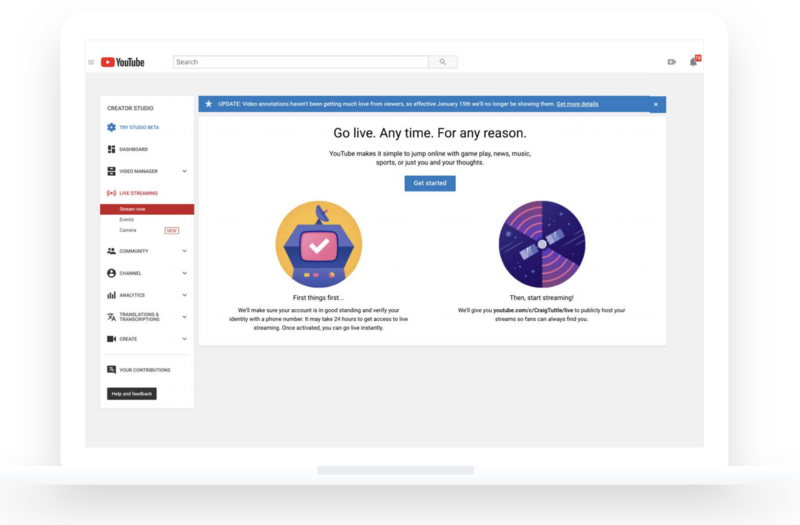 Activation for livestreaming on YouTube could take up to 24 hrs for approval. Step 1: Activate livestreaming on YouTube: www.youtube.com/live_dashboard_splash. This could take up to 24 hours to become active. You’ll need to wait until YouTube has approved your account to livestream in order to continue. Step 2: Ensure that you are already signed up with a Live Planet account. Note: You may have already created one from your android app when testing other features. If you haven’t, go to cloud.liveplanet.net/signup. 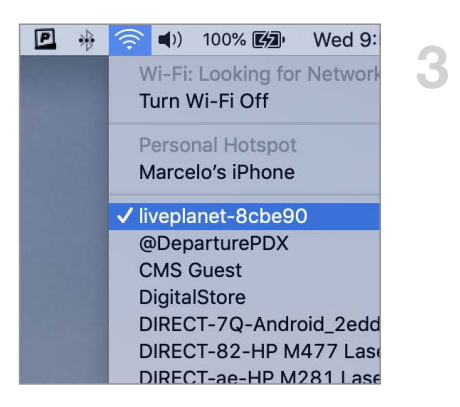 Step 3: Connect your laptop or tablet to Camera WiFi. (liveplanet-xxxxxx). Step 4: Then type 192.168.12.1 from any browser to launch camera software. 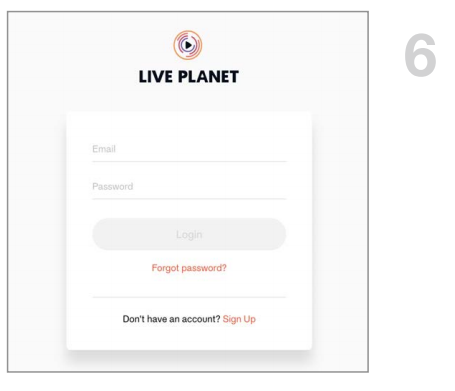 Step 5: Login to your Live Planet account from your camera software. If you see “log out”, you’re logged in already and good to go. Step 6: Sign up or Login to cloud.liveplanet.net from your laptop or tablet. Note: Camera should still be using the ethernet cable setup in the previous section. Step 7: Go to events tab and create event. Enter a name, thumbnail, and description. Step 8: Add a camera to the event. 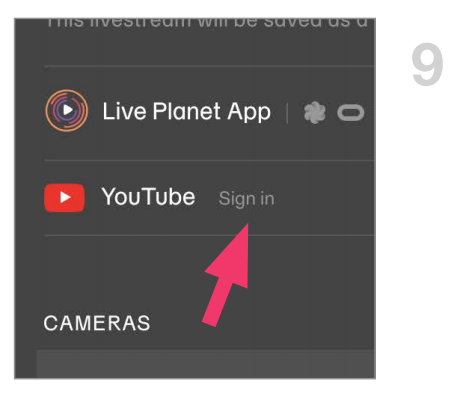 Step 9: Select YouTube as the destination to stream to and click “Sign in." 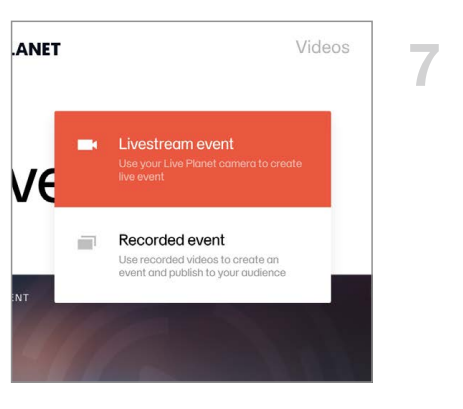 Note: You will need to link your YouTube account with the Live Planet cloud. 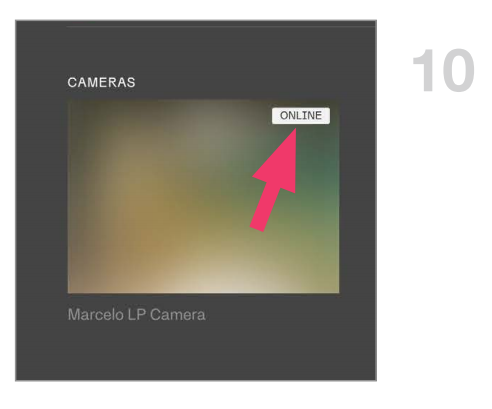 Step 10: Make sure that your camera’s status is showing as “ONLINE”. 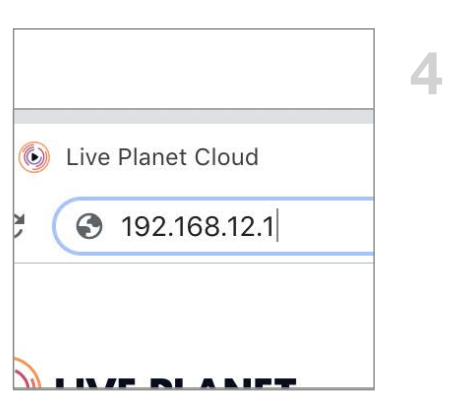 If camera shows as “OFFLINE” or no camera is shown, repeat steps 3 - 5 to connect your camera to the Live Planet Cloud. 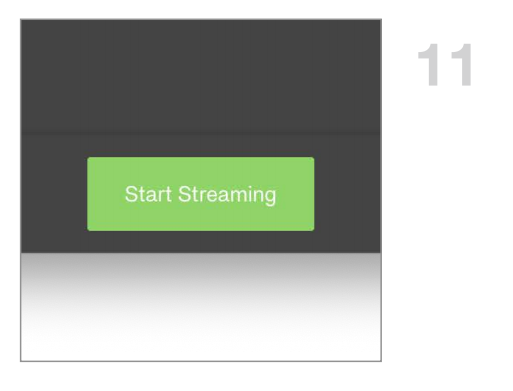 Step 11: Click “Preview” to initiate the streaming process. When it is finished, the green 'Start Streaming' button will appear - click it. 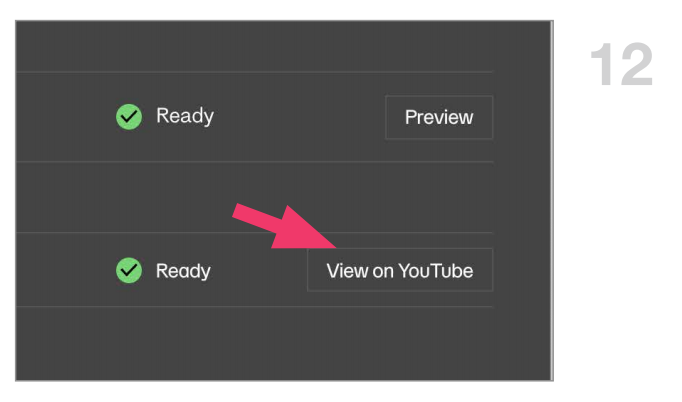 Step 12: Click on “View on YouTube” button to watch your live feed on YouTube. 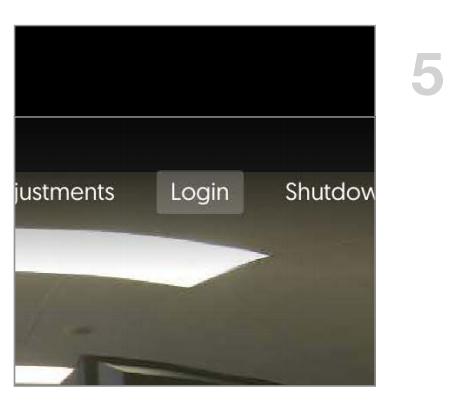 When done with livestreaming, click “End Livestream” on the Live Planet Cloud.